Press Release: "Ants in Space"
Bruce Balick, professor of astronomy at the University of Washington in Seattle, will present his spectacular images of the dying star Mz3 in a press release at the European Space Agency and the Hubble Space Telescope Science Institute. 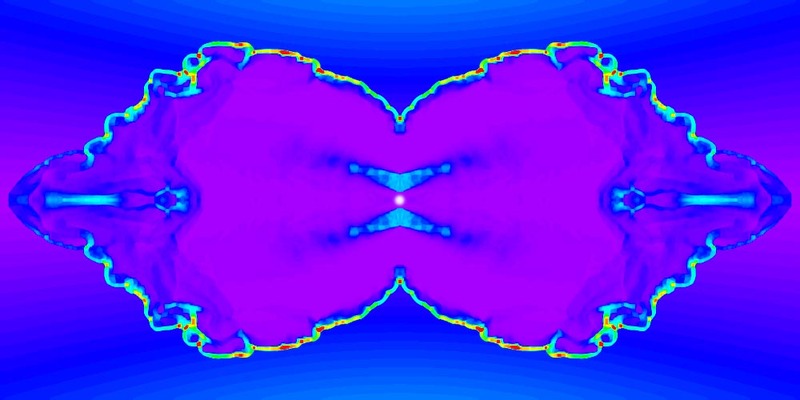 Over the years, I have collaborated with Balick and with Garrelt Mellema, doing hydrodynamical computations of the physical mechanisms behind these beautiful outflows. A brief report on my findings, with some computer movie simulations, you will find below. Ultimately, our own Sun will die in a similar event, 5 billion years from now. Does The Interacting-Wind Mechanism Work? There's been a lot of oompah in recent press releases with variations on the theme "Scientists don't understand what happens here." Well, we never know everything, do we? But the Interacting Wind Model that I and my colleagues pioneered is in excellent shape, thank you. Just for fun, look at the picture below. The left hand image is an observed nebula, MyCn 18. The right hand side shows a projection (with a tilt of 40 degrees) of the density field from one of my recent hydro runs (the central region around the star was blue-highlighted to mimic the helium ionization there). 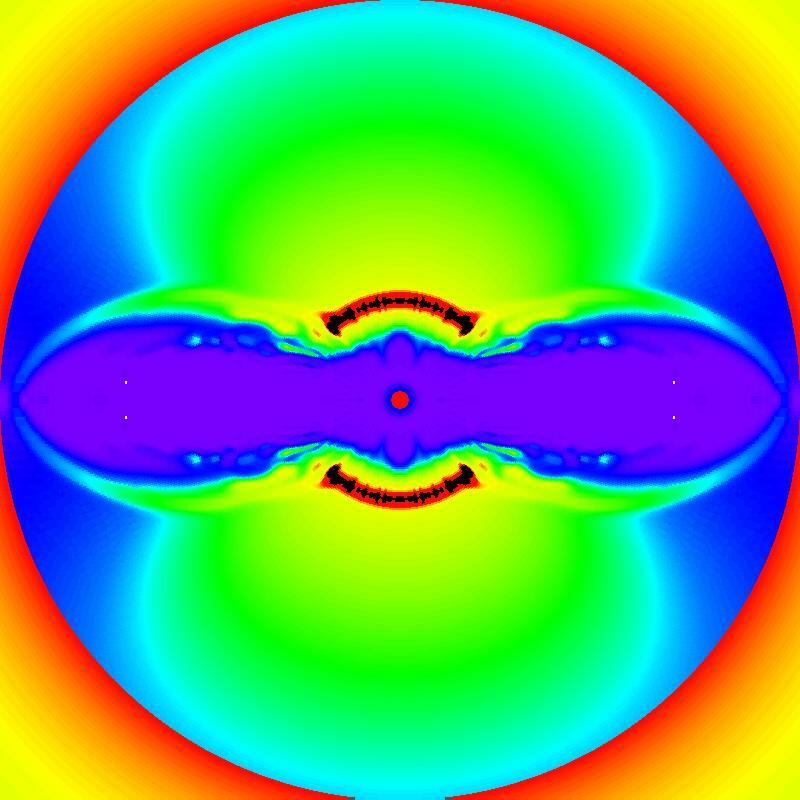 In this simulation, I compute an interacting wind model with a moderately strongly cooling outer shell. This causes a spectacular sequence of ripples due to a combination of dynamical and thermal instability. Now watch the rings in the observed image. Coincidence? Sure! 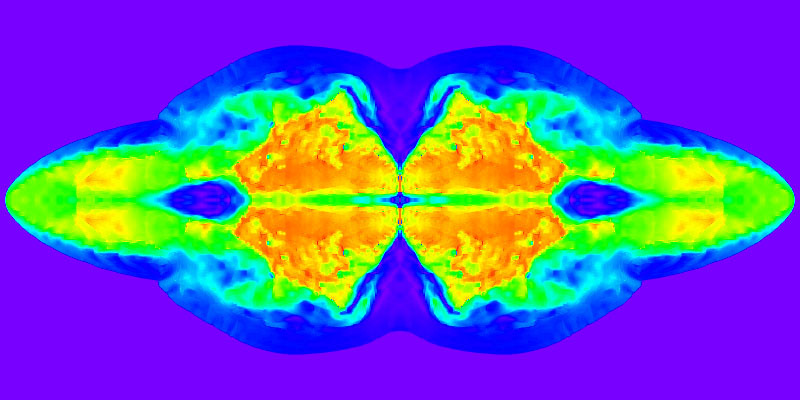 Click to enlarge Numerical computation of a conical/explosive gas stream shooting into a hyperbolically flattened cooling atmosphere. Red indicates the density, green the temperature, and blue the velocity of the gas. 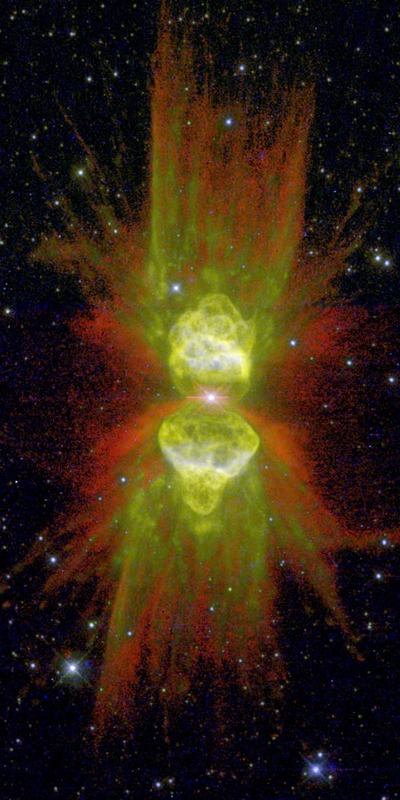 This composite image shows the nebula in cross section. It is cylindrically symmetric about the horizontal axis. The dying star, which is now a young white dwarf, is in the centre of the image. 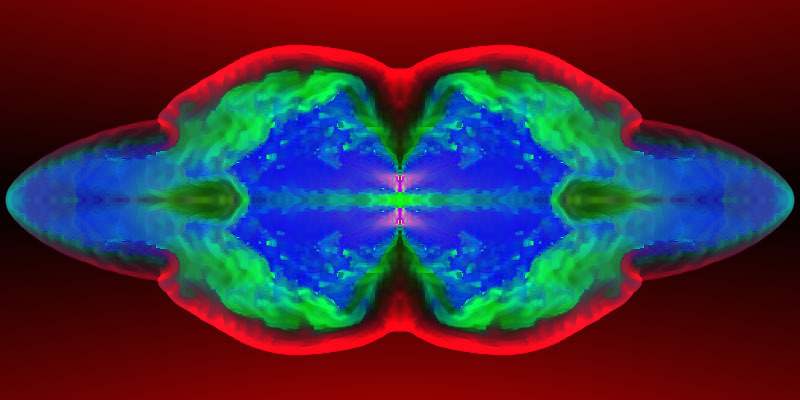 The picture of MyCn18 roughly corresponds to the red part. You can download a low-quality movie (2.3 Mb) or a high quality movie (4.9 Mb). Both are in QuickTime format using Movie JPEG A compression. Click to enlarge This image shows the density of the gas: red indicates high, blue/purple low values. The image is cylindrically symmetric about the horizontal axis. The dying star is in the centre of the image. You can download a low-quality movie (2.5 Mb) or a high quality movie (6.3 Mb). Both are in QuickTime format using Movie JPEG A compression. Click to enlarge This image shows the temperature of the gas: red indicates high, blue/purple low values. The image is cylindrically symmetric about the horizontal axis. The dying star is in the centre of the image. You can download a low-quality movie (3.0 Mb) or a high quality movie (6.9 Mb). Both are in QuickTime format using Movie JPEG A compression. Click to enlarge This image shows the velocity of the gas: red indicates high, blue/purple low values. The image is cylindrically symmetric about the horizontal axis. The dying star is in the centre of the image. You can download a low-quality movie (2.8 Mb) or a high quality movie (6.4 Mb). Both are in QuickTime format using Movie JPEG A compression. Planetary nebulae have little to do with planets. Centuries ago, when telescopes were not as good as they are now, in an era when finding new planets was the main business of astronomy, astronomers found roundish greenish objects in the sky that looked like planets but clearly were not. They didn't move around the Sun, but were fixed among the stars, and in better telescopes they were seen to be nebulous rather than firm and round. When astronomers learned about the life and death of stars, it became clear that, towards the end of the life of a star, its inner parts shrink and heat up, thereby blowing off the outer parts. In heavy stars this happens in a thousandth of a second; we call this a supernova explosion. In stars like our Sun, the final blow-up phase takes a hundred thousand years altogether. Since our Sun has a life expectancy of ten billion years, this is still very fast, comparatively speaking. It was expected that the nebulae expelled by dying sun-like stars would be spherical, since the stellar atmosphere was presumed to be ejected in all directions alike. Some recent calculations by Adam Frank and co-workers indicate that this might not be so, but in most cases spherical ejection is not a bad idea. However, it was gradually realized that spherical planetary nebulae are the exception. As Bruce Balick was first to emphasize, most planetary nebulae are two-lobed, or bipolar nebulae. In collaboration with Balick, I started to find out how that could be. It soon occurred to us that single stars, such as our Sun, are surrounded by the disk-like debris of the formation of the star; in our case, this debris consists of the planets, the Kuiper Belt and, far away, the Oort Cloud. What would happen if dying stars were surrounded by such a belt-shaped cloud of gas? The fast wind rushing away from the dying star would collide violently with the surrounding gas torus, and it was natural to expect that the gas would escape in two oppositely directed streams: a bipolar nebula. My initial theoretical calculations, done with simple pen and paper, were very promising and did indeed show the desired effect. But pen and paper go only so far, so I decided to make a full-scale computation of the hypothetical colliding star-winds on a computer. The results were far more beautiful and convincing than I had hoped. It soon became clear that colliding winds are probably the answer to the riddle of the bipolar nebulae. Numerical computation of a spherical gas stream shooting into a slightly flattened atmosphere. In this composite image, red indicates the density, green the pressure, and blue the velocity of the gas. The image is cylindrically symmetric about the horizontal axis. The dying star, which is now a young white dwarf, is in the centre of the image. Click on the image for a larger view. In the meantime, my theory group had been reinforced by Garrelt Mellema, a young graduate student who embarked upon a second aspect of the riddle: what influence does the radiation of the dying star have on the expanding nebula? The recently collapsed star, on its way to becoming a white dwarf, is extremeley hot, up to a hundred thousand degrees Kelvin. It was known that this produces an intense source of ultraviolet radiation, which not only illuminates the nebula but also splits electrons off hydrogen and other elements (a process called ionization). Mellema found that the radiation is so fierce that it drives gas away from the star, out to very large distances. Because the light can pass through the nebula, and because light always moves much faster than matter, this "pre-heating outflow" makes bizarre plume-like structures sticking out from the main body of the bipolar nebula. The beautiful image of the bipolar nebula Menzel 3 (mostly abbreviated to Mz 3) can be interpreted in the light of these theoretical findings. 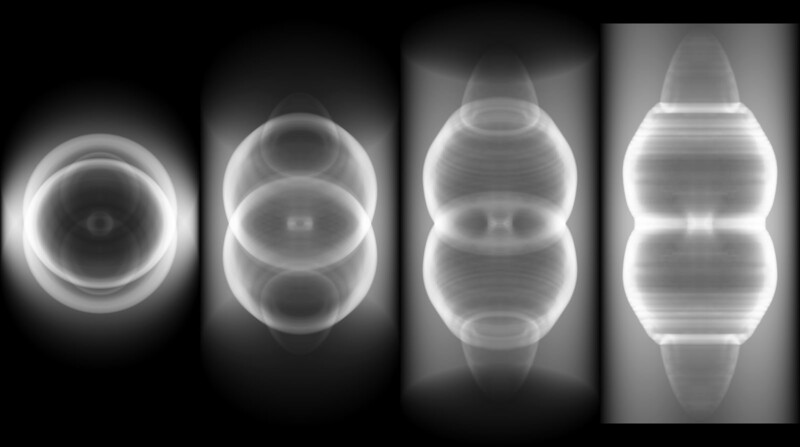 The central double blobs are the outline of a hydrodynamic shock moving outward into the denser surroundings. Inside these blobs the gas is extremely hot due to passage through the shock; this theoretical prediction was recently confirmed by observations made with the Chandra X-ray imaging satellite. The smaller bubbles protruding from the shock were not understood until recently; my theoretical calculations show that these remarkable features are due to an inward deflection of the highly supersonic gas that bounces off the inner walls of the nebula, causing a double vortex that moves outward with great violence. The radial wisps, called the "legs of the ant", are most likely due to photon propagation effects of the type studied by Mellema. 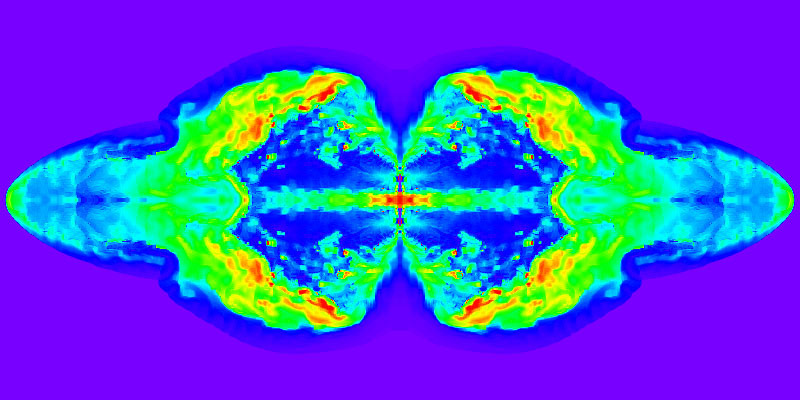 In the computer simulations shown below, the outflow of the central star is not fully modeled. 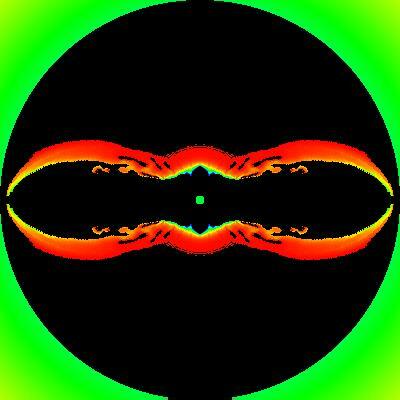 This was done in earlier work, in which I showed that a very small, inner "reverse shock" of roughly elliptical shape forms around the star. It is too small to be computable in the current setup, which was geared towards resolving the outer parts of the flow. Because I had shown in my earlier work that the reverse shock leads to a certain amount of focusing of the outflow, I have fixed the inner outflow to reflect this focusing effect. 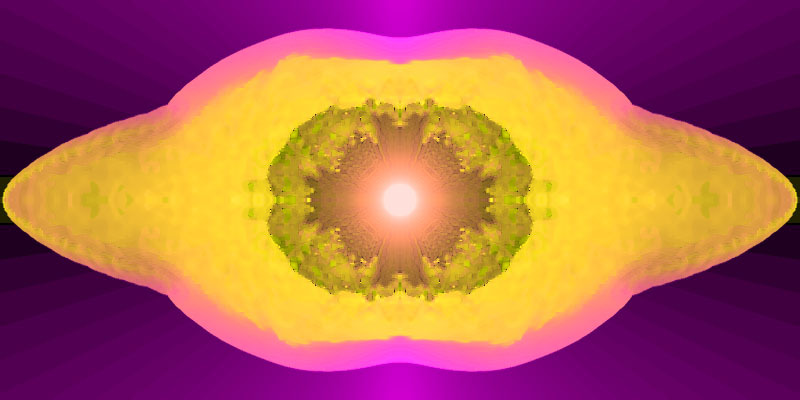 Thus, the stellar wind takes on the form of a double hollow cone in the innermost cells of the computational grid. This cone shape is quickly lost, however, due to turbulent mixing in the inner nebula. Numerical computation of a spherical gas stream shooting into a slightly flattened atmosphere. In this composite image, red indicates the density, green the temperature, and blue the velocity of the gas. The image is cylindrically symmetric about the horizontal axis. The dying star, which is now a young white dwarf, is in the centre of the image. Click on the image for a larger view. Just look up my papers in the paper press; in particular 1988 Astron. Astrophys. 202, 177; 1989 Astron. Astrophys. 211, 409; 1989 Astron. J. 97, 462; 1991 Astron. Astrophys. 251, 369; 1992 Nature 355, 524. The movies listed below were obtained by running my hydrodynamic code at lower resolution. 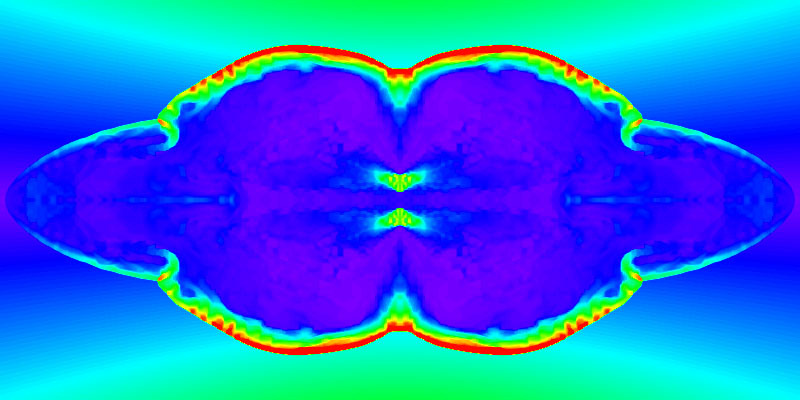 This means the following: in order to simulate the flow of gas in a bipolar nebula, space is divided into a number of cells, much like squares on a chessboard. Parcels of gas are exchanged between the cells, thereby approximating the flow in real space which is, of course, continuous and not cellular. The number of cells in a given space direction indicates the resolution, or precision, of the simulation. Computation time increases very quickly when the resolution increases. 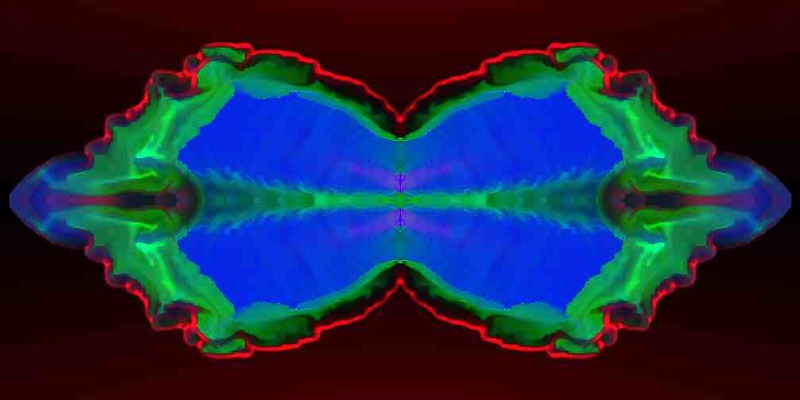 In my computations, I assume that the nebula is cylindrically symmetric, so that I only have to compute the flow in cross section; that is, effectively, two dimensions. Even such computations can take quite a long time. If N is the number of cells in a given spatial direction, computer time increases as N-cubed; that is to say, if the resolution in each spatial direction increases with a factor 10, computer time goes up by a factor 1000. This movie shows the density of the gas as it would be observed from different angles, running from 0 degrees (pole-on) to 90 degrees (where we see the nebula from the side). Black indicates high values, white is low. 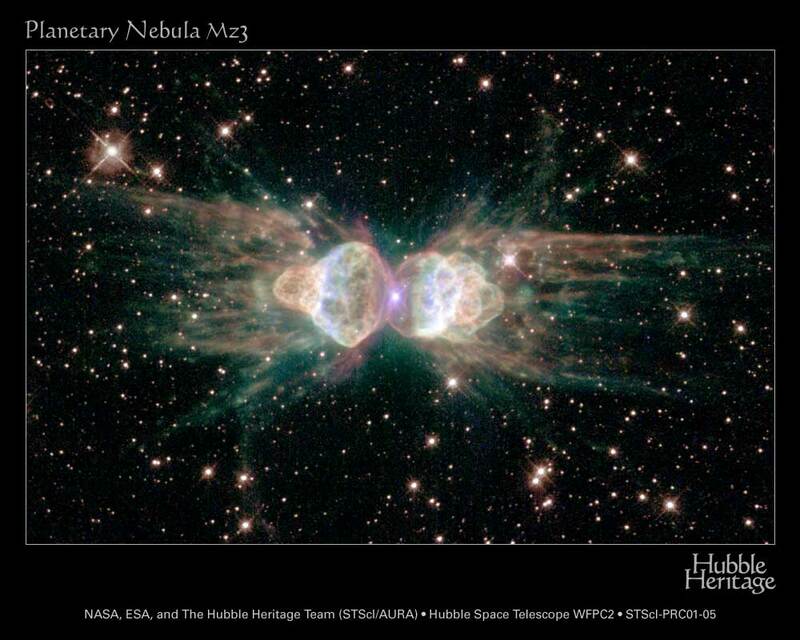 You may see clearly that the nebula is cylindrically symmetric. Notice also the parabolic caps sticking out at the ends, and the rings around the waistline and around the main bubbles. These are due to turbulent ripples propagating up into the cavities blown by the wind from the central star. This effect is clearly visible in the movies where you see the flow in cross section. The dying star, which is now a young white dwarf, is in the centre of the image. You can download the movie (332 kb) by clicking on the image. The movie is in QuickTime format. Numerical computation of a conical gas stream shooting into a slightly flattened atmosphere. In this composite image, red indicates the density, green the temperature, and blue the velocity of the gas. 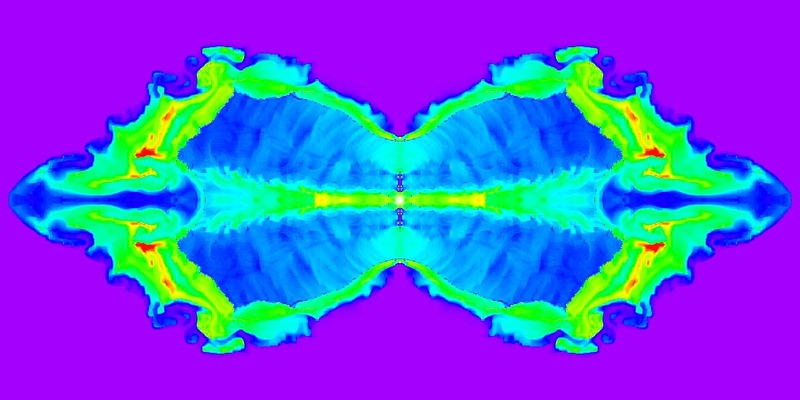 The image is cylindrically symmetric about the vertical axis. The image of Mz3 roughly corresponds to the red part. The dying star, which is now a young white dwarf, is in the centre of the image. You can download the movie (540 kb) by clicking on the image. The movie is in QuickTime format. Numerical computation of a conical gas stream shooting into a slightly flattened atmosphere. This movie shows quarters of the cross-section of the nebula. The leftmost panel indicates the density, the middle panel shows the temperature, and the rightmost one the velocity of the gas. The dying star is in the bottom-left corner of each image. The colour red indicates high values, blue is low. 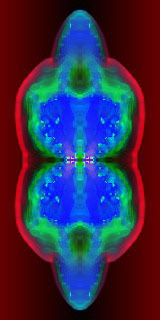 The image is cylindrically symmetric about the vertical axis, and reflection-symmetric about the bottom line. You can download the movie (584 kb) by clicking on the image. The movie is in QuickTime format. For scientific details, see the printed papers above, or browse in the electronic pages of Astronomy &Astrophysics. A collection of links to more sites with scientific information can be found on my science links page. And do not forget my astronomical images page! 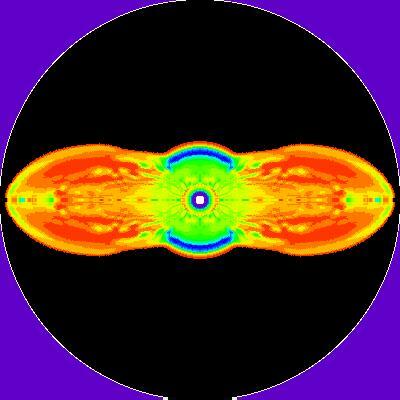 Numerical computation of a conical gas stream shooting into a disk-like atmosphere. In this composite image, red indicates the density, green the temperature, and blue the velocity of the gas. To complete the picture, the image should be mirrored about the bottom edge. 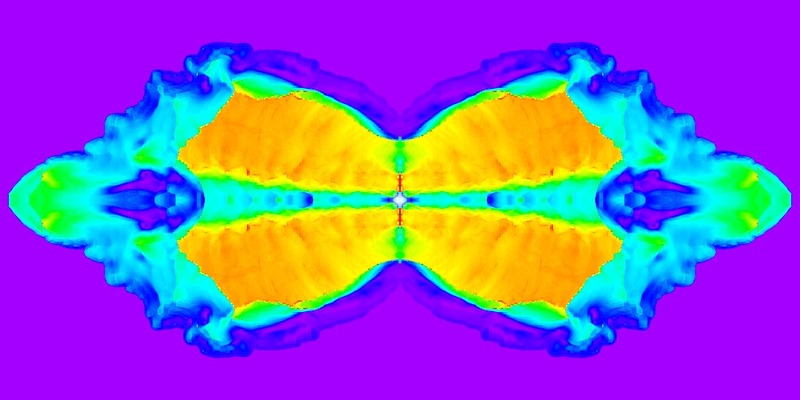 Density distribution in a bipolar nebula computed with my numerical hydrocode. Red is high density, blue is low. A diferent view of the details can be seen in a corresponding black/white image. 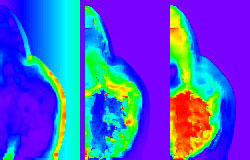 Image of the corresponding temperature distribution. Blue is high temperature, red is low. Image of the corresponding velocity distribution. Blue is high temperature, red is low. Image of the bipolar outflow in various orientations. 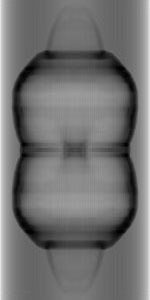 Shown is the gas density projected in the sky, with the symmetry axis under an angle of 15 degrees (leftmost), 40, 65 and 90 degrees (rightmost). Click to enlarge When the gas streaming away from the young white dwarf passes through a shock wave, most of its kinetic energy is turned into heat. 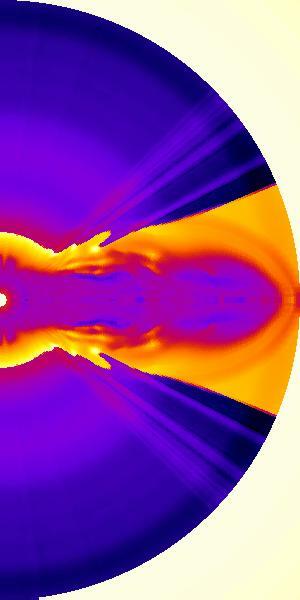 The resulting hot gas should be observable by means of the X-rays it emits. The accompanying image is a first crude attempt at showing what this would look like. The yellow colour indicates the X-ray gas, the purple colour the gas density (which ought to correspond to the outline of the nebula). Compare this with the recent images of the Cat's Eye Nebula made with the Chandra X-ray telescope. 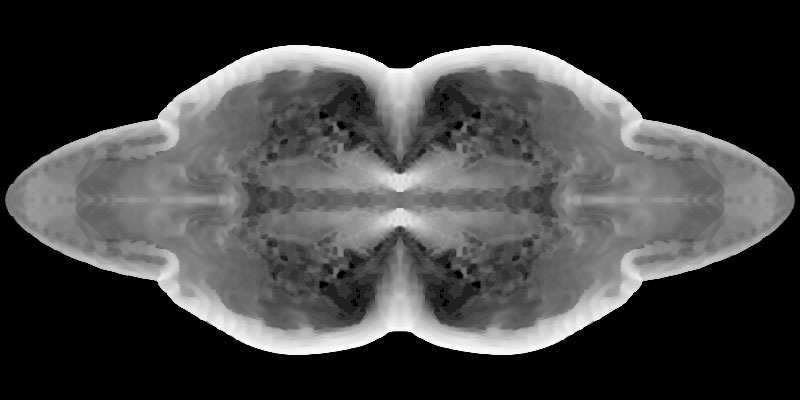 Density distribution in a bipolar nebula computed with my numerical hydrocode. Red is high density, blue is low. Click here for a picture of the corresponding temperature distribution. Blue is high temperature, red is low. Picture of the corresponding energy density distribution. Red is high, blue is low. If you want to see what observations of such objects look like, check Bruce Balick's home page, George Jacoby's sampler page or the various images at the Space Telescope Science Institute. 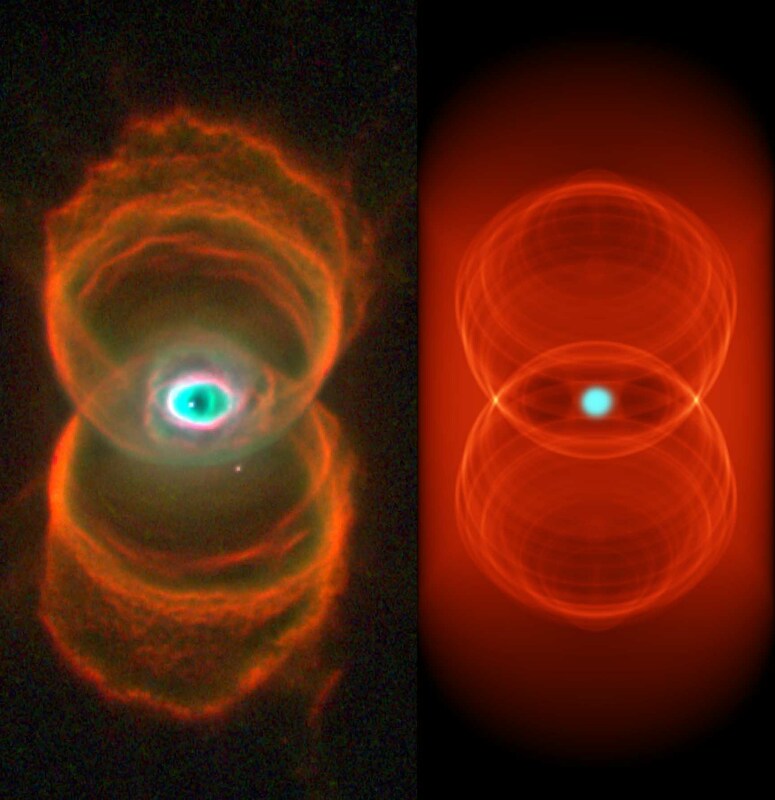 An especially spectacular one (which alo happens to fit our theories very well) is the Hourglass Nebula. A very brief synopsis of the work was written for the Fifth Annual Report of the Dutch National Supercomputer Centre under the title The hydrodynamics of aspherical two-wind configurations. More information on planetary nebulae can be found in the Database of Galactic PNe. A very large collection of superb images can be found on the site of the Hubble Space Telescope. Image of the double-lobed nebula Mz 3. 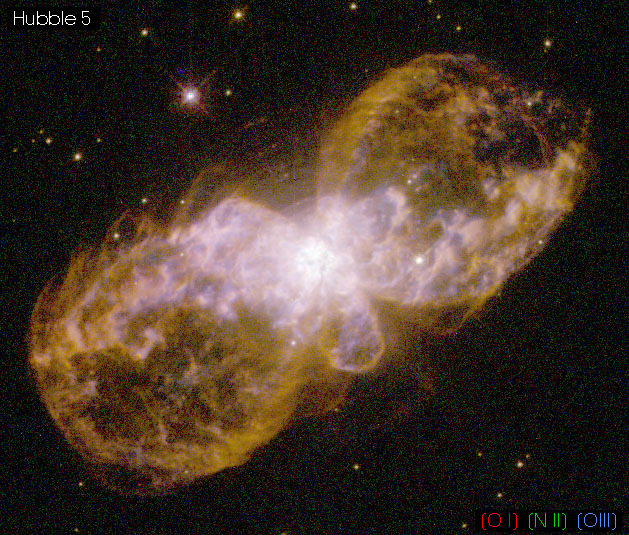 Image of the double-lobed nebula Hubble 5.